“On her beautiful, subtly bold sophomore album, Hide Nor Hair, Toronto songwriter Abigail Lapell explores themes of love and loss through a lens of geography and travel, visiting places urban and wild, local, near-local and far-flung; evoking the transience of time – day and night and the changing seasons – so that her songs belong in the here and now as much as they would in the anywhere, anytime. An indie-folk veteran of the mid-2000s Montreal scene, she’s shared stages with tUne-yArdS, First Aid Kit, Rae Spoon, Jim Guthrie, The Lowest of the Low and Andy Shauf. Lapell’s spirit is consummately DIY; her acclaimed, Earshot!-charting 2011 debut Great Survivor was recorded in a bedroom by Heather Kirby (of Ohbijou) and hand-assembled at home out of letterpress by Trip Print Press. 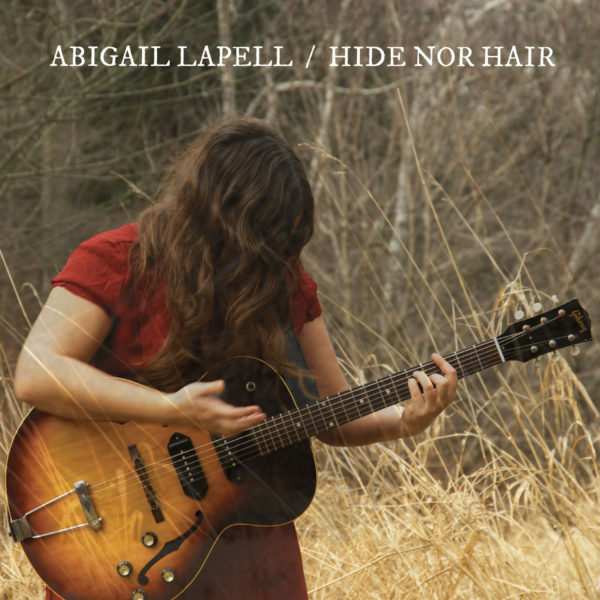 Lapell chose a different tack for Hide Nor Hair, working with mood wizard Chris Stringer (Timber Timbre, Ohbijou) at Union Sound in Toronto – incredibly, over her decade-and-a-half long career as a singer and guitarist, this was Lapell’s first time collaborating with a producer. A recent recipient of the 2016 Colleen Peterson Songwriting Award, piano ballad “Jordan” is one of a handful of tunes written on a retreat at northern Michigan’s Crosshatch Artist Residence. “Diamond Girl” and its more atmospheric counterpart, “Indigo Blue,” are both anti-love songs, whose protagonists believe they are unsuited for domestic life. Lapell goes belatedly topical on “Hostage Town,” recounting the surreal experience of trying to get around Toronto during the G20 Summit in 2010. And, in one of the most playful moments on the album, Night Bird and Morning Bird features a whistle solo (care of drummer and vocalist Benjamin Hermann) that momentarily lands the record in cinematic western territory.